New categories in the product-based shopping experience, category and classification changes, and item specifics to help buyers find your items. Expanding the product-based shopping experience including ability to suggest edits and add products to the eBay catalog. New category and classification changes to provide a more intuitive buying, selling, and search experience. Help buyers find your products with item specifics. As announced in the 2018 Spring Seller Update, eBay is transitioning to a product-based shopping experience and we introduced the first phase starting with an initial list of product lines which will now be expanded to full categories. The new shopping experience makes it easier for buyers to find your products wherever their search journey begins so they can make purchase decisions quickly and easily. Listing with the eBay catalog reduces your listing time, and improves the accuracy and value of the competitive pricing guidance we provide so you can manage your business better. Starting mid-August 2018, we will provide you with the ability as you list to contribute new product updates to products in the catalog that you may feel are inaccurate or missing critical information. You will also be able to submit a new product to be added to the eBay catalog. We strongly encourage you to begin updating your listings to comply with the requirement so that there will be no interruptions to your eBay business when we require catalog adoption starting mid-September 2018. Starting mid-September 2018, you will need to associate your Good 'Til Cancelled listings with the eBay catalog in the categories above. Otherwise, your listings may have minimal or no visibility to buyers. You will no longer be able to successfully revise an existing listing or complete a new listing if you do not use the catalog. We will continue to expand the product-based shopping experience to more categories later this year and will provide you with advance notice so that you'll have plenty of time to update your listings. Search results are grouped together by product to help buyers quickly find the specific item they are seeking. Product pages display selection, value, and a range of item conditions available on eBay -- new items, refurbished items, auctions, and more along with reviews. The top product slot for an item will be determined based on factors including price, inventory, delivery service, seller standards, and return options. Learn more about the product-based shopping experience. When do I need to start using the eBay catalog to list in the new categories? You will still be able to create and revise listings without the catalog, but we strongly encourage you to begin updating your listings in mid-August 2018 so that there will be no interruptions to your eBay business when we require catalog adoption starting mid-September 2018. How will I know which listings need to be updated? In Seller Hub under the Listings tab and My eBay will show recommendations on your existing listings that need to be updated in order to comply with the new requirement. What if I can't find the exact product in the eBay catalog that I want to list? Starting mid-August 2018, you should create a new product in the catalog by using the submit a new product or contribute a product update functionality if the catalog does not include a product that exactly matches the item you want to sell. What if I find that my product in the eBay catalog is missing product specifics or includes inaccurate information? If you locate your product in the catalog and the information is inaccurate or product specifics are missing, you can submit a product update so that it matches your inventory. What details should I include when I contribute new product updates to the eBay catalog? When you contribute a product updates to the eBay catalog, be sure to include as many product details as you can. Rich, accurate product details will help buyers find, research, and purchase your products. Provide informative and high-quality images, and important product specifics that buyers will be looking for such as color, size, memory, and carrier. What details should I include when I add a product in the eBay catalog? To add a product to the eBay catalog, provide comprehensive and accurate information so that the product is discoverable in search and buyers will have all the information they need to make a buying decision. Clear and accurate information also enhances the appeal of a product to buyers. When available, provide GTIN, Brand, MPN item specifics. The title should be clear and accurate, and the product image(s) should be high quality, with no graffiti or watermarks. A product description is helpful but not required. Learn more about catalog best practices. What details should not be included when I add new, or contribute product updates to the eBay catalog? Do not include information that belongs in the listing such as condition, price, shipping, returns, seller information, or custom modifications made to the product. You will be prompted to provide this information later in the listing flow. 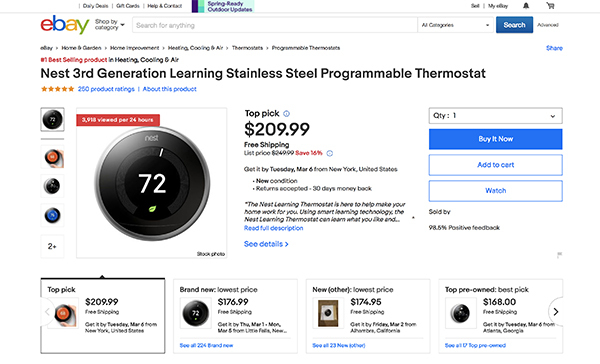 When will product information updates become visible in the eBay catalog? Product information updates typically become visible in the eBay catalog within 24 hours. Not all submissions will be published. You can check the status of your submission in Seller Hub. Why should I revise a product in the eBay catalog to correct or enhance product information if my listing already has the correct product information? In a product-based shopping experience, buyers must evaluate multiple similar products before they decide which listing to buy. Product information is supplied by the catalog and presented to buyers on the search results page. If the catalog information for your product is incomplete, incorrect, or of poor quality, buyers will be less likely to select your product. In addition, it is beneficial to you to make sure that all product information in the catalog accurately and comprehensively describes the item that you are selling. Incorrect product information could result in a returned item or a "item not as described" claim. Will I need to use the eBay catalog for multiple variation or multi-SKU listings? Yes. In first phase of the product-based shopping experience, we asked sellers to provide a valid GTIN (UPC, EAN, or ISBN) for each variation in multi-SKU listings within the initial product lines. In the new categories, each variation will require a valid eBay Product ID (ePID) in all product-based shopping experience-enabled categories. The products associated with variations in a listing must be unique and share the same category and brand. The variation-specific values that vary by products must also match the values in the eBay catalog product. Modified products, bundles, and lots will not be supported in multi-SKU listings. Offers for these types of products will require individual listings. How do I list bundles (listings that include multiple products in one offer)? How do I list non-domestic products (e.g., products that are not meant to be used in the market where they are listed)? You must select the appropriate non-domestic product from the eBay catalog and adopt it. For example, if a US seller is listing a UK version of an iPhone 6 which is locked to the Vodafone network, the US seller must select the appropriate iPhone 6 product from the catalog, which says "Non-US Versions" in the title. Additionally, the US seller is also advised to indicate that information in their listing title (e.g., UK Version/locked to Vodafone), and also share additional details, if any, in the listing description field. If the desired product is not found in the catalog, the US seller must first create it in the catalog, and then adopt it. While creating such a product, the US seller must fill out the product specific called "Non-domestic Product = Yes," and also fill out the related field called "Applicable Regions," which lists the regions in which the product is meant to function. 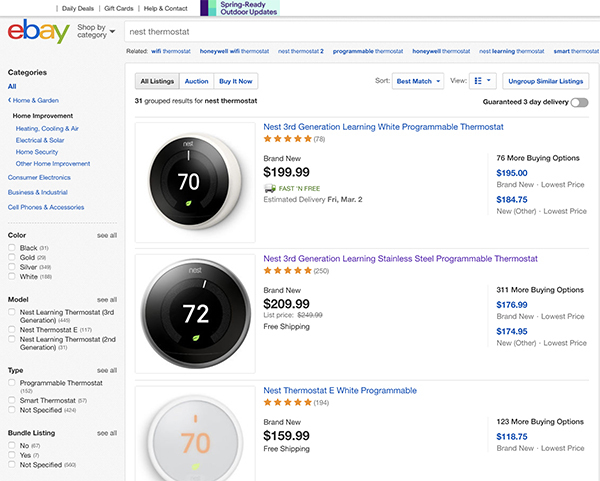 When multiple listings of the same item have been associated with a product in the eBay catalog on a product page, your items will compete with other sellers' listings for opportunities to be featured in the top pick or the primary position on the product page. Your seller performance rating must be at above standard and you must ensure your items will be in stock, and you should offer competitive pricing, shipping, and returns to improve your chances of winning the top pick. Where can I view product-based shopping experience categories that are in the eBay catalog now? You can learn more about the product-based shopping experience and view all categories that are currently enabled here. How can I learn more about the product-based shopping experience or provide feedback? If you have more questions, or wish to report issues or provide feedback about the product-based shopping experience, please visit the eBay Community. Category changes including additions, removals, and renames will go into effect July 31, 2018. The category changes will provide a more intuitive buying, selling, and search experience on eBay as we transition to a new product-based shopping experience. Updates to categories and item specifics will create more intuitive buying, selling, and search experiences and bring eBay into closer alignment with industry-standard classifications. Our new product-based shopping experience requires you to tell us exactly what items you are offering during the listing process so that we can deliver a more streamlined shopping experience to buyers. If you exclude recommended item specifics, your item won't surface to buyers when they use the left-hand navigation refinements. Please use provided item specifics in your listings to ensure they surface to buyers in their searches. When can I start listing in the new or revised categories? The new and revised categories will go into effect July 31, 2018. Which item specifics appear in search filters? How do I add or edit item specifics for my items when the item specifics in my category change? In Selling Activity, find the listing you'd like to revise. Select items and click "Edit" for more actions. Select Item specifics from the "Edit" fields menu. Edit desired listings then select "Save" and close. What can I do if my listing isn't moved to the most appropriate category? If your listing has not been automatically moved to the most appropriate category by July 31, 2018, you'll need to revise the listing and select a category that's better suited to your item. Starting July 31, 2018, when you revise or relist an existing listing, or create a new listing for the below categories, you will be required to add the following item specifics to complete your listing. These item specifics help buyers find your items more easily based on how they search today. "Certification" item specific (e.g., Ungraded, NGC, PCGS, etc.) required when you revise or relist an existing listing, or create a new listing in US Coins or World Coins categories. "Publisher" item specific (e.g., Marvel, DC, etc.) required when you revise or relist an existing listing, or create a new listing in Modern Age (1992-Now), Copper Age (1984-1991), Bronze Age (1970-83), Silver Age (1956-69), Golden Age (1938-55), Platinum Age (1897-1937), and Graphic Novels and TPBs categories. "Object Type" item specific required when you revise or relist an existing listing, or create a new listing in China & Dinnerware and Glassware categories. Section Width, Aspect Ratio, Rim Diameter, and Tire Quantity required newly listed car and truck tire listings, relistings, and revised listings. Good 'Til Cancelled listings will continue to auto-renew. However, we strongly encourage you to update your listings now so buyers can find your items quickly and easily. Buyers use industry-standard item specifics to search for items in Comics, Coins, Pottery & Glass, and Tires categories. By providing the item specifics in these categories, you help buyers find the items they're looking for quickly and easily. What will happen if I don't update my listings in Comics, Coins, Pottery & Glass, or Tires categories? Starting mid-September 2018, you will need to include item specifics when you revise or create new listings. Otherwise, your listings may have minimal or no visibility to buyers. You will no longer be able to successfully revise an existing listing or complete a new listing if you do not use the catalog. Will I be able to select from a list of recommended values to make revising my listing(s) easier? Yes. In each category a set of values will be available, from which you can select values that best match your item. If the value you’re looking for isn't included, you can add it yourself. What if I don't have the required item specifics? Comics: Nearly all comic books have a publisher and the leading publishers are available in the dropdown list of Publishers in the listing flow. If the publisher of your book is not included in our list, please enter the name manually. This will help us to continually update our database of publishers. If you want to list a self-published book you can manually enter "Unknown." Coins: Select "Ungraded" if your coin is not certified and/or graded by one of the approved grading companies. Pottery & Glass: Typically, the functional feature or purpose of the product could suggest what the Object Type is. If your item Object Type is not included in our list you may enter the correct Object Type yourself. We will periodically review and update the Object Types and include new and overlooked types that may have been missed. Take a photo of the product and ask a close colleague for a quick opinion. Tires: Tire size information can be found on the tire. Are there any exceptions for the new requirements?